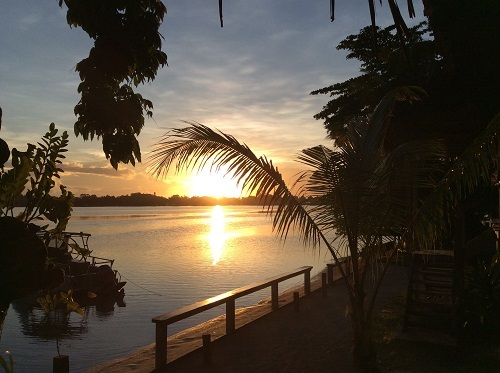 Papua New Guinea (PNG) was one of those destinations that I had always wanted to visit to get a better understanding of the people and culture. It was an adventure spanning the ever changing city of Port Moresby, to the beautiful and lush Highlands and finishing on the coast. Highlands - Tari: When the flight from Port Moresby to Tari arrived, the whole village came out to meet the plane and buy the newspaper which arrived with it. It's a 45 minute drive up to the lodge with my driver and guide, Thomas. Ambua Lodge is 7,000 ft above sea level bordering rainforest with amazing views of the Tari Valley and sooooo peaceful. Rooms are Bure style huts. Following lunch with my fellow lodgers, many of whom were passionate "birders", I went with off with my guide on a hike to a couple of the waterfalls and 3 vine bridges. We'd had quite a downpour before the hike so it was slippy and I'm super clumsy, so the lovely Thomas held my hand a good chunk of the time! The fresh air sure tired me out, after dinner back to hut and the electric blanket is now my most favorite as it kept me warm and cozy (it's chilly up in the highlands). Bliss! Next morning I was up early before sunrise and headed to the highest elevation point (9,000 ft) to see Mt Karawa and Mt Ne. Stopped on the way back for guide and driver to get Betelnut (he likened it to his morning coffee but I reckon it's better than that!). 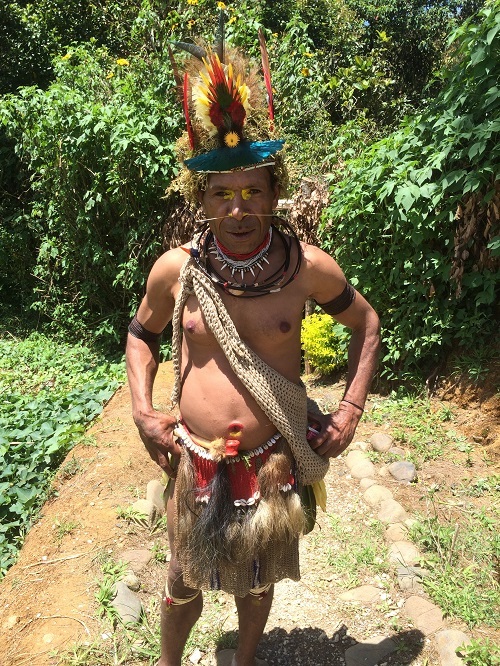 After breakfast, Thomas picked me up for a tour around the area and was dressed in full tribal regalia, what a sight. 1st stop - Women's Village. Man and wife do not live together nor do they 'have relations' in any house. The man waits outside and mentions something about work to attend to and the message is clear. The woman then joins him in the field and the rest is history! Women live together along with the pigs, a sign of wealth in these parts and powerful currency. They work the land, look after the kids and do chores. The men do their own cooking and chores as well as build houses, mud walls etc. They can also have multiple wives. 2nd stop - Face Painting. They use clay and dye in various colours but only the yellow is significant here as it represent Ambua and the Huli people. The headdress is made of 'Bird of Paradise' feathers and cassowary bones. The apron has hair from pigs tails (that you own) on the front and the more you have, the wealthier you are and the more girls see you as an attractive partner. 3rd stop - Wigman. 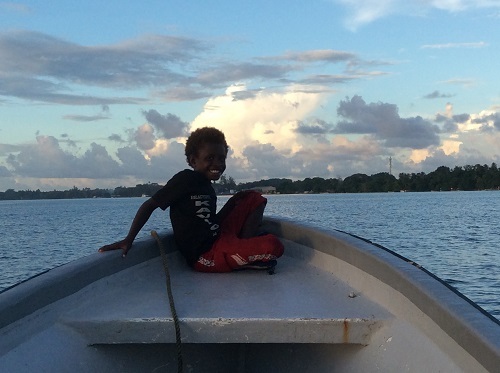 It costs 300 Kina ($100) to go to his school for 18 months. Students grow their hair and make their own wig which they can then sell for around 700 Kina for ceremonial or 1400 for everyday wig. They have to drink from a water pool three times a day which is blessed by the wigman. 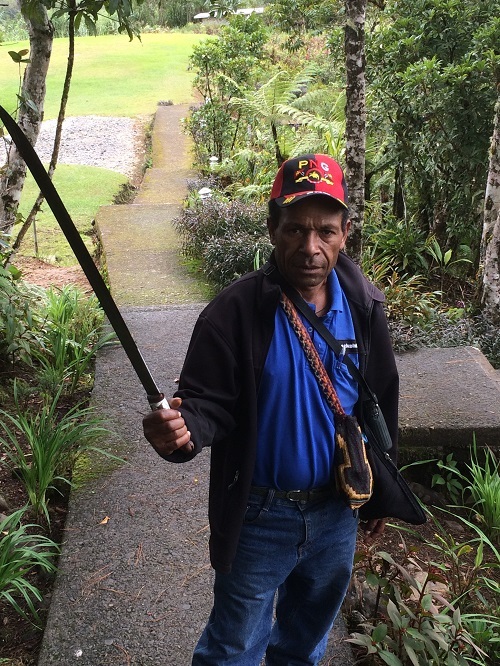 Highlands - Mount Hagen: The Mount Hagen airport is brand new, the Prime Minister is a native and may be a factor.... they have a new runway which means there will be direct flights from Australia next year. Michael, my guide, met me at the airport and took me into a couple of villages. Got to see a beautiful orchid garden, a possum, cassowary and a fabulous bird called the crown??? 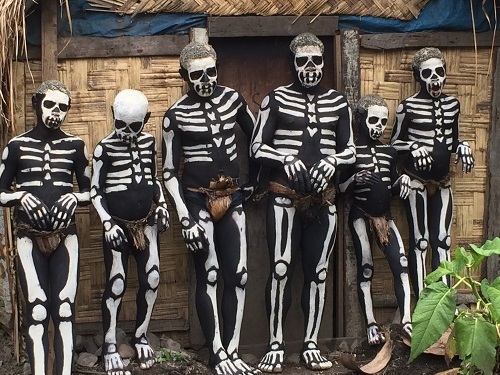 Next I was given a performance of the skeleton dance where the bodies are painted in black clay with bones in white. I then took a walk around the market. Because of its climate, the soil is great for growing fruits and vegetables and coffee. 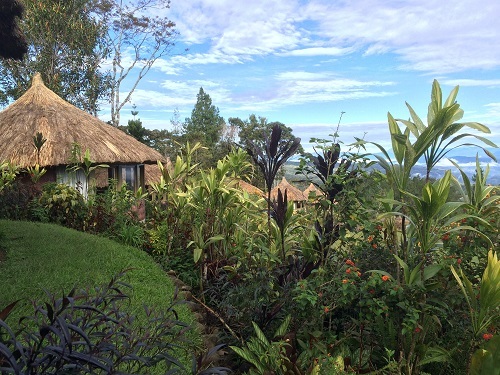 I stayed at Rondon Ridge which is lovely and has beautiful panoramic views. Port Moresby: Flying back to Port Moresby, the rainforest seems to stretch to the horizon in every direction. Stayed at the Stanley Hotel, a brand new 5 star property. I consider myself a low maintenance girl but I have to say that checking into this luxurious, modern, warm room after the simplicity and cooler climate of the highlands along with a powerful shower did feel very, very good. In the afternoon, I visited the nature park, just a short drive from the hotel. It was the Botanical Gardens but an Australian couple, both biologists, have transformed it into a safe, green space. Saw flying foxes (fruit bats), the cassowary, lots of birds including the famous Bird of Paradise (the national bird of PNG) plus a tree kangaroo! Coast: Flights from Port Moresby to Kavieng via Madus. Flight time around 2hrs. Transfer to Nusa Island resort by boat (5mins). Focus is diving. They have a few wrecks (WWII Japanese planes) and great coral, marine life. Rooms are traditional style, good food overall with plenty of choice and a cool bar. Next morning Jonathan our guide, my little friend Exley and his older brother Simon took us to the mainland for a day tour around the island. Went through town where there's a 5 day market plus shops and supermarkets as well as a bank and post office. It was payday so the town was bustling. We ended the day at a favorite water hole where we all dipped in the water. The kids climbed trees jumped off the rope swing and, under a lot of peer pressure, I joined in as well. 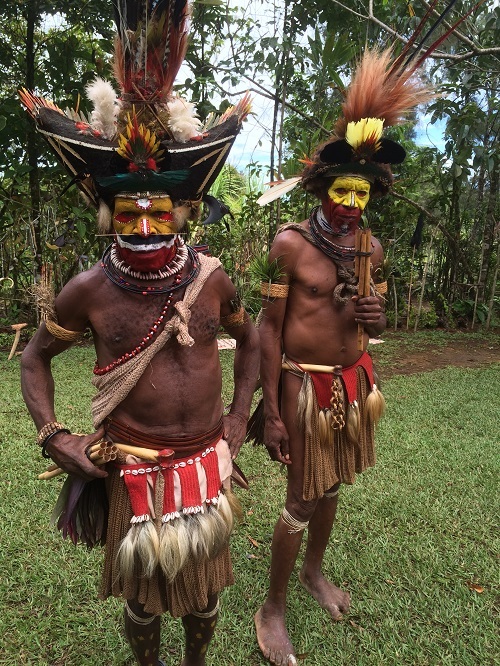 PNG is a really interesting country with amazing countryside, reefs and of course, culture. It is definitely not for everyone and expert advice is needed but for those looking for something different and to immerse themselves in the local customs, it's a must do. Please feel free to email me for more information if you are interested in planning a trip to PNG!